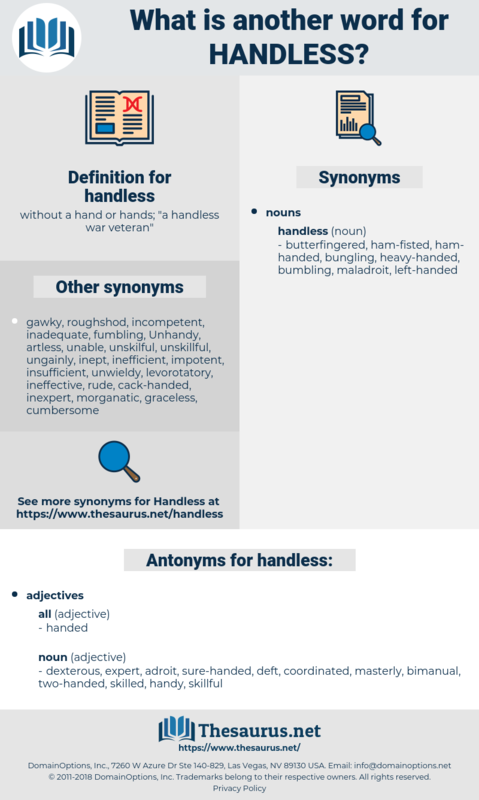 What is another word for handless? 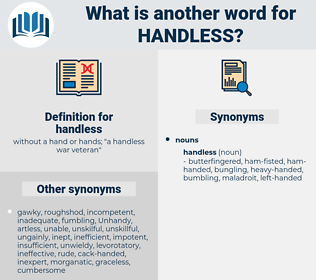 without a hand or hands; " a handless war veteran"
dexterous, expert, adroit, sure-handed, deft, coordinated, masterly, bimanual, two-handed, skilled, handy, skillful. Next to it, beyond the gaunt old woman on the sheet selling and squeezing rubber duckies in the hope of selling a few and having money to eat, a man clanging bells with handless hooks above his cup, shoe repairmen fixing soles, a kiosk of a key maker, and a blind mendicant with a speaker and a microphone singing a strident folk tune, was someone.
" And I hope, Mary, you will take care and not get into the daadlin' handless ways of the English women," said Miss Nicky; " I wouldn't give a pin for an Englishwoman."